A New Haven police cruiser bursts into flames at a construction site on Kimberly Avenue, leaving behind a burned out shell. Police union president Craig Miller said, "That thing could've blown up with (the officer) inside." The officer at the wheel got out with only moments to spare and was spotted later, unharmed, at the same job site. "He felt there was something wrong with the transmission and he looked down and seen flames coming through the hole of the floor board of the car. This is a life and death concern, it's not only a concern for us police, but the community," Miller added. 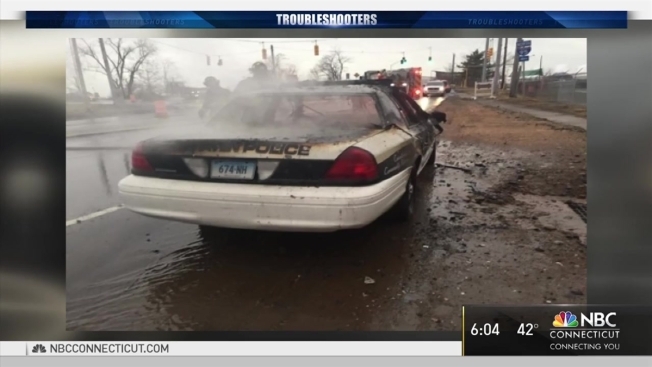 The cruiser that caught fire is not part of new haven's daily rotation, the NBC Connecticut Troubleshooters learned. It's on the "extra duty" list and union officials admit those vehicles are older. "That are not maintained properly, because our mechanics are downscaled, we don't have many at all, so it's hard for them to maintain vehicles," Miller reiterated. Miller and secretary David Totino provided a list of patrol cars that needed replacing recently and most, they say, have been, which is why they withdrew a complaint to the Department of Labor. Laurence Grotheer is the director of communications for New Haven Mayor Toni Harp, "The city took delivery on 16 new cars in October, they were purchased through the capitol budget process. In November, the board of alders approved through a comprehensive master lease program for 10 additional cars." It's unclear if the cruiser in question was getting replaced with a newer used vehicle. "I don't know. It's concerning, from what i heard from officer, it should've been one taken out, but I'm not sure," Miller added. Frotheer said the cruiser was reported "safe enough to be used on extra duty assignments." Union officials said they need more mechanics, than the handful hired now. "To maintain our vehicles, to make them safe for us, make em safe for our community, make it safe to calls, so we can have vehicles to rely on," Miller added. Grotheer said, "Interim Chief Campbel working with command staff to develop a budget for fiscal year 18, which begins July 1, and I'm sure he'll address needs of the police department in terms of maintenance staff." Campbel was off on Tuesday due to the holiday, but police union officials tell NBC Connecticut Troubleshooters he reiterated to them his concern, and they look forward to meeting with him and his command staff to resolve the issue.